Day 17: First time you heard that D&D was somehow "evil." I first got this impression from my mom, although she didn't actually come out and say it was evil. She was always more subtle about it than that. "I'm worried about you playing that game," was a pretty common statement. 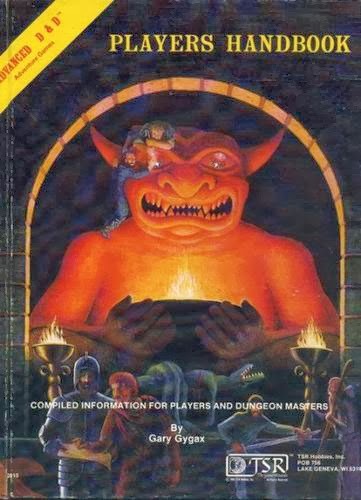 In hindsight, given that we lived in the Bible Belt and considering the imagery on some 1st edition covers (I'm looking at you, Dungeon Master's Guide), it doesn't surprise me that half my family thought the game was satanic. I think my mom just wanted to just trash my books, but we had a great relationship and she never crossed that line. The whole situation was complicated by the fact that my dad had moved out of state and I rarely saw him anymore. Those D&D books had been a gift from him, and she didn't want to take that connection away no matter how sketchy they looked. Eventually she stopped worrying about it... or if she didn't stop worrying, she at least stopped expressing her concerns. Either way, these days I think my family and friends worry more about me never realizing my childhood dream of writing for D&D than they are about it corrupting me somehow... and that's definitely a step in the right direction as far as I'm concerned.